Technology will be used to harness the laws of physics, with the gyroscopes and sensors, a high-performance braking system, active suspension, night vision and robotic assistance. A digitally encoded learning key will start the engine. To move forward, the rider activates a trigger on the left handlebar. The landing gear retracts when the speed reaches 20 km/h. To turn, the rider leans in the desired direction. I love it when technology is used to harness the laws of physics. Science fiction enthusiasts may recall the smart bike from Distraction, the 1998 novel by Bruce Sterling. Those well-versed in the classics may also remember the tumblebug from Robert Heinlein's 1940 novella The Roads Must Roll. 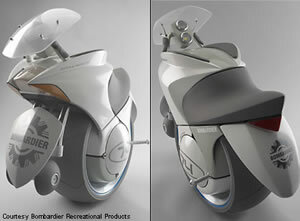 As the folks at Bombardier say - "riding the Bombardier EMBRIO concept in the real world would be a thrill." We agree!